Galusha & Sons estimating department utilizes the latest technology, enabling us to assist you in the many facets of Design Build. Teaming up with Design and Geo-technical Engineers we can evaluate the most practical and economic approach and bring your project to completion on budget without sacrificing quality. We have a long history with large commercial projects such as: Wal-Mart, Home Depot, Lowe’s, Hannaford, and Price Chopper. Working with Capital Region Developers we have had a hand in building The Bethlehem Town Center, Catskill Commons, Northway Plaza, Kinderhook Commons, Congress Park Plaza, Ellsworth Commons and many more. 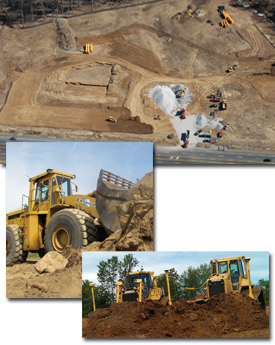 In the residential-development world, Galusha & Sons has installed infrastructure, earthwork and paving for both Single Family Subdivisions, as well as, Multi-family Apartment Complexes.